Odette was born in a sycamore tree. Barbara Jean was born on the wrong side of the tracks. Clarice was the first black baby to be born in an all-white hospital. How do the circumstances of each woman’s birth shape her choices as adult? Their interactions with one another? Their relationships with their husbands? When things get tough for the Supremes, they often see the funny side of the worst moments. Moore has a lot of fun with cousin Veronica and her donut-eating daughter. In what other instances do the Supremes use humor to help them survive? Odette, Clarice, and Barbara Jean are best friends, but they’re quite different. What is a defining moment in each of their lives? 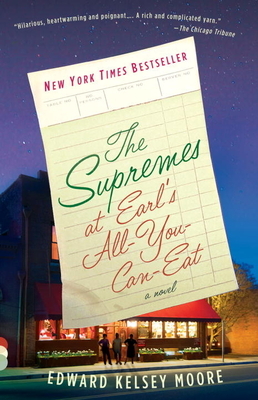 Commenting on “the tender considerations that came with being a member of the Supremes,” Odette says: “We overlooked each other’s flaws and treated each other well, even when we didn’t deserve it” (p. 37). What other qualities make the friendship among the three women so extraordinary? In what ways do they help one another? The chapters alternate between Odette’s voice and an omniscient third-person narrator. What is the effect of this in storytelling? Why does Moore choose Odette as a narrator rather than Clarice or Barbara Jean? Ghosts appear throughout the novel. What does Odette’s mother’s voice add to the story? What kind of personality comes through? In what ways does she represent a voice of wisdom, and can this be helpful or aggravating to Odette? One of Dora Jackson’s beliefs is that “what we call miracles is just what’s supposed to happen. We either go with it or stand in its way” (p.296). What seemingly miraculous events occur in the novel, and why do some characters choose to “go with it” and others “stand in [their] way”? Earl’s All-You-Can-Eat is the first black-owned restaurant in Plainview, Indiana. What role does place play in the novel, and how does the diner shape the lives of the main characters? The Supremes grew up in tumultuous times. How was each one of them affected by the major social changes for African Americans, as well as for women, that occurred over the course of their lives? How are the men who love the Supremes—James, Richmond, Lester, and Chick—each a reflection of the woman he loves? And what does each husband give to the woman in his life that she treasures, despite his failings? Why does Clarice decide not to move back in with Richmond, even after he feels they’ve patched things up? What other changes do you see in Clarice after her separation from her husband, specifically in her relationship with music and religion?Do you think she will follow her dream as a musician? Do you think that after a life of hard knocks, Barbara Jean will finally find happiness with Chick? Or is she destined for more tough times ahead? Whether alive or dead (or a ghost), the mothers of the Supremes play a major role in their daughters’ lives. As the Supremes grow older, how do their mothers continue to exert an influence on their adult lives? Who is hurt most by it? Who is helped by it? Who is most like her mother as she gets older? Odette, Clarice, and Barbara Jean each attend three very different churches. In what ways did growing up in these particular churches help to shape them into women they ultimately became?